The first version of my project is using the HX711 24 bits A/D converter. I wanted to have better performances in resolution and temperature drift, so i build a newer version with the HX712. I only can get some variation in heavily unbalancing the differential input (with a low value resistor). It’s like if the amplifier has almost no gain ! I have a very stable 5V for the analog part and the digital part is working with 3.3V coming out of Arduino pro mini. I tested 2 of them on 2 different pin set. nothing works so far. I tried 2 different libraries and everything is normal (power_up, down, etc…), except the poor readings. Has anyone used or tested this chip ? Did i buy crap of fake ? I wanted to have better performances in resolution and temperature drift, so i build a newer version with the HX712. I don’t think that strong temperature correlation is caused by the ADC / load cell IC. Have a look at the thread HX712 24-Bit ADC @weef found out that temperature dependencies are more - in sense of bad - with the HX712. Can you say some more about your setting? What load cell do you use? What temperature related differences do you have? What library and sketch do you use? I would expect that massively temperature related differences are caused by (a bad) load cell. Anyway, now i’m there and i would at least like to find out what’s wrong in my design. As load cell, so far i used a L6E by ZEMIC rated for 150 kg. Recently, i bougth several 100kg cells from China, but couldn’t get any datasheet for them. They look very similar to the L6E. But the moment, the problem is somewhere else. In my newer project, i use the HX711 library from Bogde which should work up the gain 128 and 10Hz rate. I also tested the only other one for HX712 i’ve found. I tested their examples, and none is working. I can’t see what could be wrong in my design and i double (well triple) checked the wiring. I used the switched output of the HX712 to switch an external voltage regulator to save some current. The cells are supplied with the switched 5V, so is the analog part, and the digital part is supplied by the Arduino at 3.3V. The complete setup is powered by a 12V battery and consumes 300uA with everything connected. I don’t think the problem could come from here. I will test this with a single supply, just to exclude this possibility. As already mentionend, it is like if the HX712 has no gain at all… I had to heavily unbalance the input to get some data variation coming out. Just for the sake of completeness. The HX712 has now two GND for the analog and digital part. Did you connect both to ground? And for the two power sources. Did you connect both GNDs together? Note: This library is tested with a HX712 in the reference configuration. The two chips I used (marked HX712 5510192) could not be set to a gain of 256, only the rate could be changed. I searched on ebay for a HX712 breakout but did not find one. Did you use the pure chip or could you get a breakout board? Yes, i have both ground connected together, analog and digital as well as power. For me, the BAT “input” has a problem. Some voltage, close to Vcc, is coming out of it. That is quite disturbing for the rest of the setup. Yes, i saw this comment about the impossibility to change the gain to 256. But lately… I have the same batch of ICs ! The first 55 should be the manufacturing year. The newer one have 77. I think i will got the safer way and redesign everything with the HX711. At least, i’m sure it works ! I want to do the same. Use an external 5V regulator and switch it with the base output of the HX711, leaving the internal regulator unused. Are you using the HX711 and if yes, this way ? I don"t know what the BASE pin is producing and if it can be used directly as ENABLE signal for a regulator. I forgot to answer you about the HX712 board. I did my own board with four of them. I’ve made a Web page on which i collect the datas from my prototype (with HX711). From this page, as admin, i can configure all the sytem. My project is to have at least one system on each of my apiaries and build some for friends. If you want to see the backside, please drop me a private mail. I made some tests in wiring a small test pcb with a HX712 in his simplest version. It worked at first try ! In contrary of what the internal diagram of the HX712 can suggest, the AVDD input has to be at same voltage as REFP. So i did cut a trace on my pcb and routed the 5V to AVDD, and voilà ! Not a big deal, and i can continue ! Nice graphical realization! What framework do you use for the graphs? I did some research times ago and build my first visualization with dygraphs, a JS framework. Now we have a powerfull backend with Kotori, Grafana and Influx DB, see Grafana . This platform is open for everyone. So in cas you will play around with it you are welcome! As mentioned in the other thread about the HX712 (sorry, German) I see not too much advantages for the HX712 over the HX711, perpaps you need the higher gain in case you have only 1mV/V excitation. For me it is the simplest way and outcome is - till now - ok.
You are using 4 load cells. I am preparing a prototype with 4 cells some other here at hiveeyes also. @Juergen will try a similar setting as you. Read each load cell separately. I think he has planed to use the 4-channel ADS1234. I have made good experiences with the “little brother” ADS1231. But there is no breakout for this chip available. I have learned in the meantime soldering this tiny bugs but our concept is a as much as possible DIY concept for beekeeper with less hardware skills. So I will try to tie the 4 cells together in parallel and use only one HS711. I use Highcharts for the graphs, it’s awesome and free for private use. You can do almost everything with, the limit is imagination. You’re certainly right, the HX712 doesn’t bring anything if the 256gain factor can’t be used. It has some advantage though, but knowing what i know now, i would probably not use it again. Anyway, it works now and the datas coming out are stable. I did put 4 converters, so anyone can use it how he wants. 1 cell/hive or any other combination. I used the switched output of the HX712 to switch an external voltage regulator to save some current. The cells are supplied with the switched 5V, so is the analog part, and the digital part is supplied by the Arduino at 3.3V. When internal MOS power switch is used for the external load-cell, both HX712 and the load-cell will be powered down. I suppose that the digital part of the HX712 then still is powered, othwerwise normal function could not be reestablished by PD_SCK - the data sheet here is as inaccurate as most Chinese IC documentation. This is most likely the result of back-feeding - the sink BAT (the second, single-ended ADC input) became a source via the internal protection diodes because of your void case REFP > AVDD. I found the HX712 english version of the datasheet later on, but it still is not on their Web page ! I used Google translate and the chinese version does not say the same about the BAT input. It claims that it has to be connected to DVDD if not used, what i did. And yes, DVDD is always supplied. Now, i’m facing another problem i discovered yesterday evening. Adding the fact that i can’t use the 256 gain, it was probably not a good idea to use these chips ! The safest way to use these chips is to use the internal switch, leave the AVDD stable and the BAT on this pin. Everything i wanted to avoid, for power saving and noise reinjection on the AVDD line ! Not sure if they will answer. I finaly found out that if the AVDD doesn’t appear long enough before the chip is waked up, it produces garbage. So, i modified my board with some track cuts and wires. I now have the 5V low noise regulator working permanently and this 5V is applied to the AVDD pins of all HX712. The OUT pin is now connected the REFP and the cell. The BAT input is left unconnected as there is no interest for me, being powered on a 12V battery. Evrything works fine now and as expected, except the 256 gain setting that does not work. 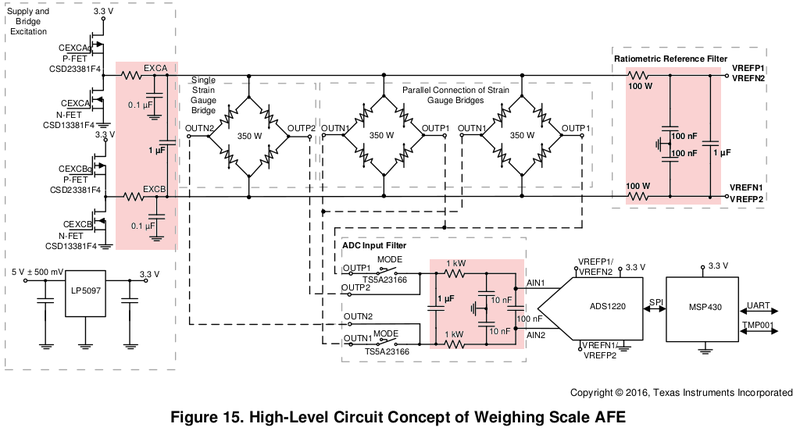 When detecting battery input, AVDD is used as the ADC’s data conversion reference voltage. …and not REFP; their internal switched voltage divider on BAT ‘sees’ AVDD as ref. 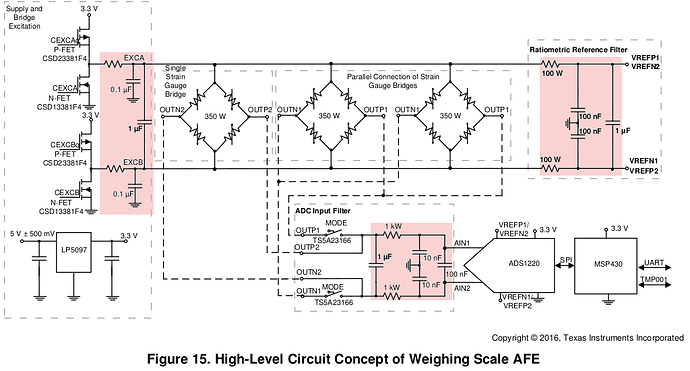 That’s also why they could allow BAT being connected to the "Regulator"s input and having AVDD and DVDD behind (in their reference PCB design)… funny data sheet. except the 256 gain setting that does not work. Thanks for all these technical infromations. Yes, the datasheet is really unclear concerning this BAT input. I find it useless, with a gain factor 1 and such an input voltage divider, it only can be used to detect the presence of a voltage. Just for fun, i will try to connect it to the 5V line and see if there is a difference. I personally don’t need a gain of 256, having standard 2mV/V cells. But i thought i could use these chips and someone can connect lower ouput voltage cells. But it seems that, at least the batch i have, they can’t be switched to 256 ! I had to remove the 100 Ohms, due to the hacks i had to make on my pcb… I didn’t try to see if the voltage drop through these 100 Ohm would affect the measures. Any idea ? For the moment tracking my other problems, i shorted the 1kOhms in the input. I will remove the shorts and try with the 1kOhms. BTW, the LT1761 i use has quite low quiescent current, so leaving it working all time to avoid timing problems doesn’t make a big difference. Actually with the Pro mini, the DS3231, the DS18B20 sensors and the BME280, i have about 320uA when in sleep. The GSM itself consumes a lot more during the short period it transmits. In contrary to what i thought, i got an answer from Avia to my questions about the HX712. But this answer is quite disappointing ! The HX712 DOES NOT have a gain of 256 possibility !! So, there is no reason to use it over the HX711. This batch is coming from our factory. HX712 can’ t be used at a gain of 256. AVIA SEMICONDUCTOR (XIAMEN) CO. , LTD. Thanks, Patrick, for this information! May you ask Avia about an official datasheet. Is this an error in the documentation or not implemented in the current batch only and will be available in the future for the HX712? We are sorry that we don’ t modify the datasheet in time. We will revise it. Well, this datasheet can be found since many years… I don’t know what they’re playing. In any case, that’s not serious ! It started to be a good product, but now it looks more like a reworked HX711… It’s still a nice chip to use, but not as expected. I wanted to have as much voltage i could on the cells, and that’s why i added the 5V regulator. this I don’t get: HX711’s band gap VBG is 1,25V, VSUP starts @2,7V… but: Where does this 2,45V come from? Don’t you use an external PNP and incorporate the ‘LM317-style’ LDO in the HX711 for sourcing the cell (and AVCC)? How dare you! ;) You do want to drop an RTC/TCXO which gives you 2ppm worst case over full industrial temp spec, resulting in less than 2 minutes off per year, don’t you?! Any chinese counterfait or ‘ghost-shift’ DS3231 is way better than a DS13x7 or the like. Your design already incorporates this IC part, and it is perfect for a node having a WWAN link itself and no local gateway providing the link as well as accurate system time stamps). the DS3231 does not run from VBAT. If VCC= 0V and VBAT >= 2,3V, the the 3231 lives on a timekeeping ‘battery’ current IBATT as low as typ 1uA, max 3,5uA! 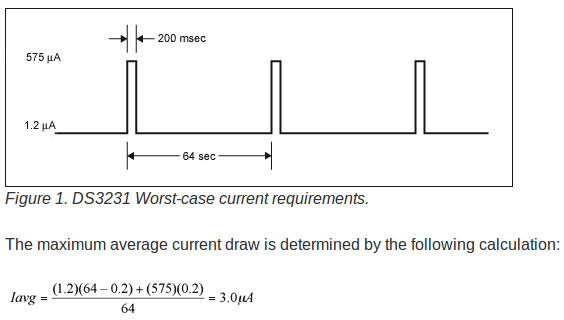 Current is the averaged input current, which includes the temperature conversion current. So, by sourcing the DS3231 via a GPIO pin (and RV + decoup caps to make this ‘switch’ low-impedance) and using VBAT most of the time (similar to that), you can achieve an averaged one-digit uA drain for the DS3231. You still can wake up the processor via INT by RTC alarms (see INTCN, A1IE (A2IE) and BBSQW bits). I’m not familiar with the DS3231M (nor DS3232(M), DS3234) which has different entrails (they don’t mention a TCXO anymore but a TC MEMS resonator…that’s why the SO8 packages was feasible).